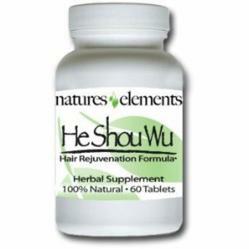 Natures Elements is an online retailer for herbal supplements and vitamins; which has helped thousands of customers prevent gray hair and help stimulate hair growth with a powerful 12:1 He Shou Wu extract. Thank you so much! The service was excellent and the price was very reasonable. He Shou Wu has been known for its ability to nourish the liver and kidneys and provide a better blood flow to the scalp thereby stimulating healthy hair. He Shou Wu can not only stop graying hair but also provide numerous health benefits, including lowering cholesterol and blood pressure due in part to its Lecithin Content. This certainly makes it a tonic worthy of taking for the rest of one’s life. Natures Elements is among the few companies providing customers with the Auto-Ship feature. This gives the customer 20% off all reoccurring orders and provides the benefit of convenient automatic delivery.